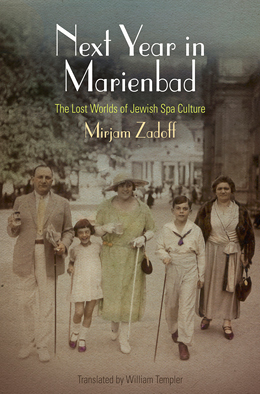 LMU historian Mirjam Zadoff’s book “Next Year in Marienbad”, which portrays Jewish life and culture in spa resorts of Central Europe during their heyday in the period prior to the Second World War, has won the Salo Baron Prize. From the closing decades of the 19th century until the 1930s, the spas of Carlsbad, Marienbad and Franzensbad, in what is now the Czech Republic, were popular vacation destinations for members of the European bourgeoisie. Among those who regularly spent the summer season taking the waters at these resorts were many Jewish visitors. In her doctoral dissertation Mirjam Zadoff of the Department of History at LMU Munich shed new light on the social and cultural history of the spas, portraying them as spaces of Jewish life. An English translation (which was made possible by the “Geisteswissenschaften International program”) of her thesis, which appeared last year, has now won the Salo Baron Prize awarded by the American Academy for Jewish Research. The Prize is awarded annually to the author of the best first book in the field of Jewish Studies. During the summer months, the Bohemian spas offered visitors a combination of health-promoting relaxation and stimulating new encounters. The urbane resorts offered the latest in medical treatments including X-ray and phototherapy, as well as hydrotherapy and mud-baths. But summers at the spas were also filled with social engagements and recreational activities. “In the summer months, the spas were transformed into cultural centers of Jewish life, and for Jews they became something akin to an imaginary home,” says Mirjam Zadoff. The Jewish communities in the spa towns took care to cater for the particular needs of their Jewish guests. There were Jewish newspapers in the shops, kosher food was available and cultural events that would appeal specifically to a Jewish clientele were arranged. In the off-season, however, blatantly anti-Semitic attitudes could once again manifest themselves – a phenomenon referred to at the time as “Carlsbad winter anti-Semitism”. During the summer season, however, the spa towns patronized by Jewish visitors could appear entirely apolitical. Indeed, during the First World War, they even served as havens for Jewish refugees who had been forced to flee when the Russian Army invaded Galicia in 1914. This influx of refugees sparked a number of charitable Jewish initiatives, but the spa resorts clung to their image as a paradise for the rich. In the postwar period between 1920 and 1925 Carlsbad actually became a center for various Zionist movements. “The advent of an openly Jewish culture and way of life transformed the town,” says Zadoff. After the Second World War, this phase in the town’s history was briefly revived, when Jewish soldiers and refugees chose Carlsbad as the venue for a series of conferences that took place in the years 1947-1949.